Sean Power has included Conor Gleeson, Shane Bennett and Patrick Curran in his team. Shane Bennett was one of the goalscorers in Thurles on Saturday. WATERFORD HAVE NAMED their team for Thursday’s Munster U21 hurling championship semi-final against Cork, with three of the heroes from the weekend’s senior win over Kilkenny set to start. Conor Gleeson and Shane Bennett both started for Derek McGrath’s side during Saturday’s pulsating senior championship win over the Cats, with Bennett scoring a goal, while Patrick Curran came off the bench. All three have been included in Sean Power’s side for the last four showdown with Cork at Walsh Park (7.30pm) as the Déise continue their quest to defend the provincial crown they lifted last year. Limerick face Clare in the other Munster semi-final on Wednesday evening. Email “3 of Waterford's heroes against Kilkenny named in U21 side for Cork clash”. 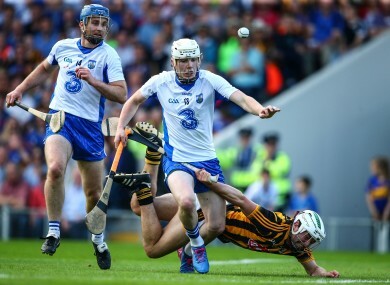 Feedback on “3 of Waterford's heroes against Kilkenny named in U21 side for Cork clash”.